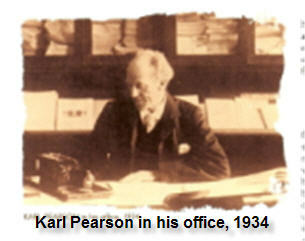 Karl Pearson was born 150 years ago on March 27, 1857; he died April 27, 1936. He made important contributions to statistics; he is usually remembered for two path-breaking achievements: his “product-moment” estimate of the correlation coefficient (dating from 1896), and the chi-square test (introduced in 1900). But, on the 150th anniversary of his birth, there is a small striking discovery he made in 1895 that is virtually unknown today, yet well worth knowing. Everybody knows that the binomial distribution is “like” a normal distribution if the number of independent trials (n) is large and the probability of success (p) on a single trial is not too near 0 or 1. Everybody knows this because Abraham De Moivre proved it to be true in 1733. Accordingly, every student knows that for most practical purposes, if you want to calculate the probability that a binomial count X will fall between two limits, P[a le X le b], where le means “less than or equals,” you would be foolish to do other than use a normal approximation. 4. The Correlation Coefficient: Its Values Range Between Plus/Minus 1, or Do They? 6. Different Data, Identical Regression Models: Which Model is Better? 8. Statistical Terms: Who Coined Them, and When?